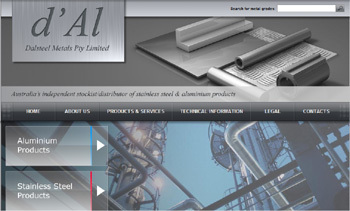 Dalsteel is one of the largest independent multi-metals stockholders, with an extensive inventory of aluminium and stainless steel. Dalsteel provides customers with a cost-effective single source for all their metals requirements, together with a comprehensive processing service which includes polishing, coating, blanking and 'cut to length' in conjunction with our partners. Dalsteel offers a responsive and competitive service for supplying anything from single item orders to major JIT contracts and specialty indent supply, tailoring this service to the individual needs of every customer from small local businesses to major multinational corporations. With 4 service centres nationwide, Dalsteel has service centres in Sydney, Melbourne, Brisbane and Wyong on the NSW Central Coast. There are plans to expand into other regions in the future. Every Dalsteel service centre holds stocks to meet the immediate needs of customers in their local area. with infrastructure in place to provide a delivery service to any part of Australia.